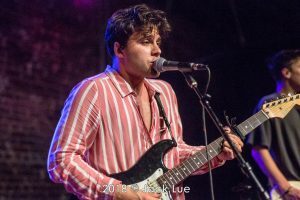 The Stolen, a pop rocking band on the rise from New Jersey, made their way back to The Hi-Hat in Highland Park for an exhilarating mid-week performance. This indie based collective has been making quite a name for themselves as of late, with two very well received EP’s (I’m So Dead and Fragile) and a cross-country tour supporting Jake Miller to their credit. Now on their second headlining visit to the Golden State, they had a good amount of fans at The Hi-Hat when they took to the stage after 11:00 PM for a show that was well worth the wait – complete with a very special guest! This band knows how to deliver a song that will jangle away in your head for ages, as clearly demonstrated throughout the evening. White Dress is the perfect example of a tune that should be played all over the radio airwaves, and was a definitive standout when unveiled live. Another highlight was hearing the gorgeously wistful West Coast being performed right in the heart of the City Of Angeles. The Stolen lineup presents a collection of talent that really knows how to deliver within a live performance. Dom Cuce is a dynamic front man, conveying the spirited lyrics and rhythm guitar interludes with a wide-eyed passion and conviction. Rob Chiarappa absolutely shines on lead guitar, filling the cavernous Hi-Hat with a gloriously atmospheric wall of sound. And what a top notch rhythm section The Stolen possesses, featuring the talents of Kevin Smart on bass and Mike Chiarappa on drums. Recently signed to Revival Recordings, one of The Stolen’s latest singles for their new label is Rooftop, featuring a guest appearance by Jake Miller. This exceptional selection was composed on the day of Anthony Bourdain’s passing and deals with the subject of suicide prevention. 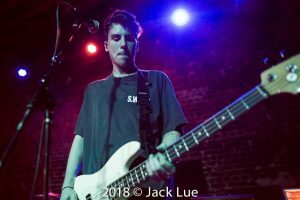 After an impassioned introduction of Rooftop by guitarist Rob Chiarappa, who would jump onstage to sing his part in the song but Jake Miller himself – rendering this one of the most extraordinary moments within The Stolen’s already memorable set. Expect to hear a whole lot more from The Stolen in future days, as their timeless tunes and thrilling live performances are certainly not to be missed. Watch for our exclusive interview with The Stolen in next print issue of Highwire Daze magazine, out January 9th throughout Southern California and via mail order!